Although Medellin has made great strides in leaving behind the violent history of its most infamous inhabitant, there remains one part of town that heralds the notorious drug kingpin: Barrio Pablo Escobar. Medellin has been making grand efforts to turn its back on its gloomy history associated with the disturbingly violent career of Escobar, emerging as an innovative, forward thinking metropolis. 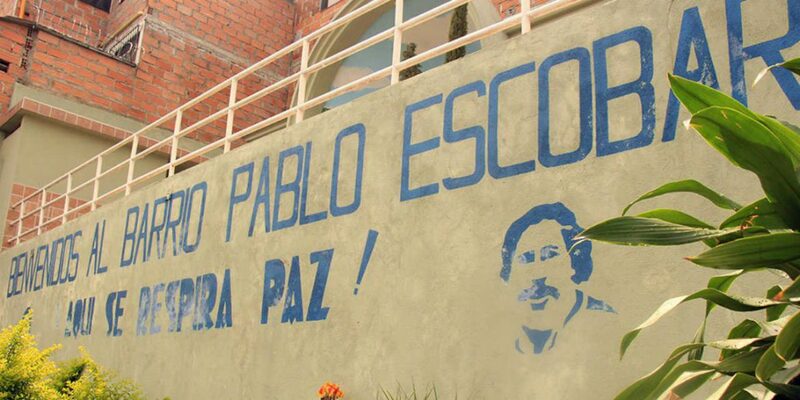 But in Barrio Pablo Escobar, the locals regard the notorious drug kingpin as a saint with a “good heart”. Originally called “Medellin Sin Tugurios,” or Medellin Without Shanty Towns, Barrio Pablo Escobar is located high up on the eastern slope of Medellin,’s valley and seems very similar to many of the other “barrios” or poorer neighborhoods in the city. The big difference is the shared sense of inherited affiliation and gratitude that the locals have towards Colombia’s most violent criminal, who was personally responsible for over 4,000 deaths including three Colombian presidential candidates, a justice minister, more than 200 judges, dozens of journalists and more than 1,000 police officers. In this sense Barrio Pablo Escobar, a name ignored by the government, is one of a kind; it is a small pocket of roughly 15,000 people in a city of 2.5 million where Escobar continues to be highly esteemed by all members of the neighborhood who felt abandoned by the government. In the barrio, the mention of Escobar’s name triggers at least a respectful nod or some sort of mention of gratitude, as opposed to the more customary fed-up-eye-roll at being asked to talk about the widely despised man for the umpteenth time. At first glance of the main street, the neighborhood is like any other with the characteristic red brick and grey cement houses precariously piling on top of each other up the steep mountain face. Salsa music, accordion rhythms and even Miley Cyrus can be heard simultaneously, booming out of various windows and locals wander about getting on with their day; catching a bus, walking to school or buying groceries. On either side of the road, narrow passageways with sudden twists and turns drop down or scale upwards navigating between the tightly packed houses. The thing that adds an edge to this neighborhood, however, making it not quite the same as its neighboring barrios, are the massive, proud pop-art murals of Pablo Escobar that adorn the streets, the shrines of the narco that sit in people’s homes and the shared gratitude that these people will seemingly forever have for the infamous, cold blooded capo that tore up Colombia until he met his fate on a Medellin roof top in 1993. Like most other neighborhoods in Medellin, Barrio Pablo Escobar has prominent presence of the Oficina de Envigado, the crime syndicate founded by the drug lord in the 1980s and still in control of most of the city. Notwithstanding, the atmosphere in the neighborhood seems calm and unassuming. The people of Barrio Pablo Escobar, like many in Medellin, are hard working survivors who are getting on with it. They are however part of Escobar’s legacy that he left behind; a population who had nothing until the kingpin turned their lives around with housing and schools, gaining their mass, loyal support in return. Before 1982, the area was a wasteland inhabited by thousands of people unable to put a roof over their heads. “Robin Hood” Escobar saw this as a perfect opportunity to save the day while gaining backing, which remained even after he tried and failed to become an elected representative in the 1982 Congressional elections. According to local resident Luis Muñoz, Escobar transformed the wasteland in to a neighborhood, providing building materials, furniture, and houses for these previously homeless people. A humble character with a very knowing look in his eye, Don Luis was the founder of the neighborhood’s donation-based library in 1992, set up to try and provide local children with basic learning resources that the government failed to provide. According to Don Luis, during the time that Escobar was on the run after he escaped from his self built prison, “The Cathedral” in 1992, the houses and even the library of Barrio Pablo Escobar served as hideouts for the fugitive and his cronies. “If he was here, he was hiding,” said Don Luis, after explaining the communities’ feeling of gratitude towards the man, and willingness to do anything for him, including turning a blind eye to the fugitive’s presence. Undoubtedly Escobar is one of the most horrendously destructive and sickeningly twisted stain on Colombia’s history. In the neighborhood, the locals are not shouting his praises from the rooftop, but instead are quietly grateful and respectful to the man who in their eyes has provided them with more than anything that the government ever has, and seemingly with enough to weigh out against the atrocities he committed.